Who were the best and worst U.S. presidents? In the past when historians and scholars have rated the presidents, their evaluations often have been based on individual charisma, activism, and service during periods of crisis. Taking a distinctly new approach in Recarving Rushmore, Ivan Eland profiles each U.S. president from Washington to Obama on the merits of his policies and whether those strategies contributed to peace, prosperity, and liberty. This ranking system is based on how effective each president was in fulfilling his oath to uphold the Constitution. Contrary to the preferences of modern conservatives and liberals, this oath was intended to limit the role of the federal government. Readers will be intrigued to discover why, of the four men given exalted representations on Mount Rushmore, only Washington deserves the honor. They will learn why Teddy Roosevelt has been overrated; why Jefferson hypocritically violated his lofty rhetoric of liberty; and why Lincoln provoked a civil war that achieved far less than believed. Readers will uncover why some presidents are rated much higher than the conventional wisdomfor example, Warren Hardingand some rank much lowerfor example, Harry Truman. As for more modern U.S. chief executives, Republicans will be astounded to learn that Nixon was the last liberal president and that Reagan wasnt all that conservative. Democrats will be amazed to learn that Clinton was in some respects more conservative than George W. Bush and why both Obama and Bush are ranked as bad. Readers will learn why the author goes against the grain and anoints Eisenhower and Carter as the two best modern presidents. U.S. presidents who are regarded highly by historians, journalists, law professors, and the public often fare poorly when we consider the ill effects of their policies or their unfaithfulness to the Constitution. A new ranking of the presidentsone that focuses on how effectively they advanced peace, prosperity, and liberty within the limits of their constitutional powersvirtually turns upside down those rankings that praise a president because he was a charismatic leader, a good manager, or served during a time of national crisis. This book essentially tries to rank the presidents as the Constitutions framers might havehad they been around to do it. 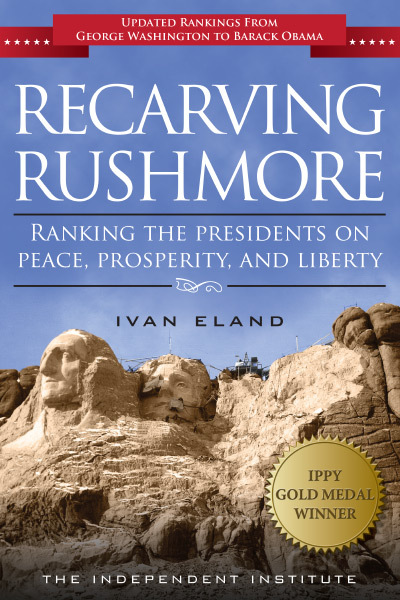 Figuratively speaking, Ivan Elands Peace, Prosperity and Liberty (PP&L) rankings show that recarving Mount Rushmore is long overdue. Abraham Lincoln, often ranked as one of the three greatest presidents in U.S. history, helped to provoke a bloody civil war and then pursued it ineptly and brutally. The war nominally ended slavery, but for many decades African Americans experienced only marginally more freedom from bitter white southerners than before their emancipation. Peaceful alternatives to Lincolns policies might have achieved better results more quickly. Far from the being the number one president, Lincoln earns a low PP&L ranking of 29, placing him in the category of bad presidents. Thomas Jefferson, although a proponent of small government, imposed a trade embargo that curtailed the liberty he championed rhetorically and led to starvation in America. His unconstitutional approach to making the Louisiana Purchase and his forced relocation of Native Americans to less desirable land farther west set bad precedents for acquiring new territory. Jeffersons PP&L ranking is only 26, placing him near the top of the bad presidents category. George Washington expanded the role of the federal government and the powers of the presidency beyond what most of the Constitutions framers envisioned. He also set other bad precedents, including unconstitutionally crushing the Whiskey Rebellion. Washington earns a high PP&L ranking of 7, placing him solidly in the category of good presidents, because, despite his shortcomings, he had republican intentions, shunned becoming a king or dictator, and left office after two terms. Barack Obama and George W. Bush are usually considered very different in their political outlooks and philosophies, but their policy track records show striking similarities. As for Barack Obama, this updated edition of Recarving Rushmore rates him as one of the worst presidents in U.S. history, ranking him slightly higher than George W. Bush. Like his predecessor, Obama has pursued ruinous domestic policiesincluding massive bailouts, Keynesian fiscal stimulus, nationalization of industries, and increasing public debtas well as substantial infringements on civil liberties. Yet despite significant flaws, to his credit Obama has had the most restrained foreign policy since Gerald Ford and Jimmy Carter, making his presidency slightly better overall than that of George W. Bush. Who were the best and worst U.S. presidents, and what criteria should be used to make a meaningful comparison? Presidents are often judged by their personal charisma, intellect, oratory skills or management stylebut are these traits the most important ones for a president to possess? Couldnt a very intelligent, well-spoken, charming taskmaster, who served during a time of national crisis, also be a lousy president if his policies undermined freedom, hampered economic progress, and made the country less safe? Conversely, couldnt a boring president with average intellect and unexceptional skills excel in the Oval Office if he also possessed other qualities in abundance, such as a firm commitment to the principles behind the Constitution? Recarving Rushmore takes a distinctly new approach to evaluating the presidents. While academics and pundits have often paid natural respect to war heroes and to those who have expanded presidential power, Ivan Eland (Senior Fellow, The Independent Institute) cuts through bias and political rhetoric to deliver the first no-nonsense presidential ranking system based purely on what they did. Profiling every president from George Washington to Barack Obama, Eland analyzes each mans policy decisions and ranks them based on the core principles of peace, prosperity, liberty, and adherence to the Constitutions limitations on presidential powersin other words, as the Founders might have rated them. Academics and pundits on the political right accuse their counterparts on the left of a tendency to rank the presidents according to their own agendasand vice versa. The prejudices that analysts bring to a ranking of the presidents, however, are more complex than that, Eland explains. Presidents are often judged by their personal charisma, intellect, oratory skill, or management style. Their chances of being deemed a great president improve significantly if they served during a war or other crisis; bland men in boring times usually get little respect. Moreover, analysts often overemphasize the importance of presidents who presided before Woodrow Wilson, when the size and scope of the executive branch was much smaller. Eland makes the case for ranking the presidents based on whether their policies promoted peace, prosperity, and liberty (PP&L). He ranks the presidents on each of those three components and compares his PP&L rankings with the alternative rankings made by the Federalist Society/ Wall Street Journal, the Siena Research Institute, and free-market economists Richard Vedder and Lowell Gallaway. The Founders of the republic recognized that the United States had a fairly secure position against most military threats, with weak neighbors at its borders and two oceans buffering it from the worlds conflict zones. These advantages allowed the United States to stay out of most foreign wars and to avoid maintaining large standing armies in peacetime, which the Founders viewed as a threat to civil liberties. More recently, however, presidents have tended to abandon that foreign policy for one of overseas interventionism, a trend Eland views as counterproductive and costly. Consistent with the Founders visionand in stark contrast to rankings that often reward presidents simply because they provided leadership during wartimeElands ranking method gives presidents credit for avoiding wars and for conducting only necessary wars of self-defense. Presidents receive demerits for conducting wars of choicethat is, most wars in U.S. history, Eland writes. In the category of promoting peace, Eland gives his highest rankings to three presidents: John Tyler, Warren Harding, and Herbert Hoover. Tyler exercised restraint in dealing with an internal rebellion, a bloody Indian war, and a boundary dispute with Canada. In foreign policy, Harding was exceptional, keeping the U.S. out of the entangling alliance of the League of Nations, negotiating a separate peace with Germany, and securing the first significant arms control agreement in U.S. history. Hoover, although a proponent of U.S. interventionism abroad, showed restraint in foreign policy by avoiding sanctions and not threatening force against Japan after its invasion of Manchuria and by eschewing Wilsonian interventionism in Latin America. Eland gives his lowest peace rankings to six presidents: James Madison (invasion of Spanish Florida, the War of 1812), James Polk (Mexican War), William McKinley (Spanish-American War), Woodrow Wilson (World War I, massive U.S. meddling overseas), Harry S Truman (Hiroshima and Nagasaki, Cold War, Korean War, interventionism in the Middle East and elsewhere, the military-industrial complex), and George W. Bush (Iraq and Afghanistan)with John F. Kennedy (Cuban Missile Crisis, Bay of Pigs, Vietnam) and Lyndon Johnson (Vietnam) tied for the second lowest rankings in the peace category. In the category of promoting prosperity, Eland gives his highest rankings to John Tyler, Martin Van Buren, and Rutherford B. Hayes. Tyler supported a sound policy of limiting the growth of the money supply, and generally opposed high tariffs, a national bank, and federal welfare to the states. Van Buren showed proper restraint during an economic crisis and worked toward limiting federal and executive power. Hayes returned the United States to the anti-inflationary gold standard (which helped pull the economy out of a recession), restored the nations credit, and kept federal troops out of a violent labor dispute. Eland gives his lowest prosperity rankings to two presidents: Franklin D. Roosevelt (the New Deal, wartime expansion of the state) and Lyndon Johnson (the Great Society and other federal programs). Closely behind are William McKinley (new taxes, favoritism for select businesses, progressivism), Woodrow Wilson (Federal Reserve System, Federal Trade Commission, renewed antitrust activism, groundwork for expanded government), and Harry S Truman (Fair Deal, intervention in labor disputes, increased economic intervention). Many presidents have expanded the executive branch beyond what the Founders envisioned. This inflation of presidential power has distorted the original system of checks and balances at the expense of the legislative branches of government, and has resulted in the imperial presidency and the erosion of U.S. citizens liberties. Presidents often claim that they are preserving liberty while, at the same time, they are taking actions to subvert it, writes Eland. Eland ranks George Washington as the best president in the category of preserving liberty, with John Tyler and Grover Cleveland tied for second place. Although Washington expanded executive power beyond what the Constitution envisioned, he also limited presidential powers in crucial ways, stepped down after two terms, and ensured the survival of the new constitutional system. Tyler favored limited government but fought members of his own party on this principlethereby torpedoing his chances for a second term. Cleveland pursued benevolent policies toward Native Americans, including trying to protect land in Indian Territory (now Oklahoma) from white settlers, giving them U.S. citizenship, and doling out reservation land for individual Indians to farm under the Dawes Act. Eland gives his lowest rankings in the liberty category to Woodrow Wilson (Palmer raids, Espionage and Sedition Acts), with Thomas Jefferson (Embargo Act, Indian policy) and Harry Truman (domestic surveillance, persecution of alleged communists, erosion of constitutional checks and balances) tied for the second lowest ranking. Tied for third lowest place are John Adams (Alien and Sedition Acts), James Polk (war to grab land intensified conflict over slavery, Indian casualties), William McKinley (suppressed freedoms abroad), Ronald Reagan (Iran Contra scandal, signing statements), and George W. Bush (expanded executive power, erosion of civil liberties). Elands top presidents for the PP&L composite rankingsTyler, followed closely by Cleveland, Van Buren, and Hayessound obscure to many today. At the same time, Elands low rankings for Reagan, Kennedy, and FDR also put him out of step with most academics, pundits, and the public. However, if we value peace, prosperity, and libertyand, especially, adherence to Constitutional stricturesthen the presidents must be judged according to their enthusiasm for principles which themselves may often run counter to popular prejudice. Ron Paul, former U.S. Congressman and candidate for President of the United States. "Recarving Recarving Rushmore: Ranking the Presidents on Peace, Prosperity and Liberty is essential reading for any study of U.S. presidents."